The BRK CO5120BN Carbon Monoxide Detector is a single or multi-station alarm that senses Carbon Monoxide in your home, office, or other living space. Easy to install, this unit meets building code regulations where AC / DC Carbon Monoxide Alarms are required (separately or in combination with smoke alarms or heat sensors). The BRK CO5120BN Carbon Monoxide Detector is designed to be installed by itself or in a connected system with other alarms or devices. 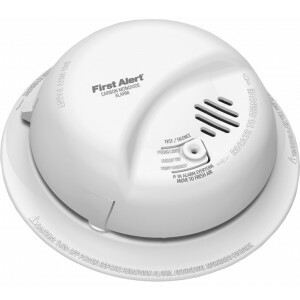 The BRK CO5120BN can be connected to up to 18 devices including other alarms, bells, sirens, repeaters, or strobes to meet ADA regulations if needed. Featuring a advanced electrochemical sensor, an 85db horn, Intelligent Sensing Technology (to avoid nuisance alarms), a 9V backup battery, and a silence feature. Easily prevent vandalism or theft with the locking mounting bracket and battery compartment. Using the Quick Connect wiring harness, installation is quick and completed in a matter of minutes. The Carbon Monoxide Detectors installed when my hose was built 11 years ago began to fail...replaced batteries, but began beeping always at night it seemed after a month or two. Since I replaced them with new units, I have had no problems whatsoever. Very Happy with purchase. Have recommend this to many other residents of my development. In my house, I have both wired and battery alarms installed, but 15 years of trouble-free operation is enough for them, so I figured it was the right time for a replacement. The hardwired veteran was replaced with the BRK C0512BN, 'cause I was looking for an inexpensive, easy to mount and snap to use model. Honestly, neither I've looked through manuals nor specifications - the 5 star rating bribed me. Additionally, I was glad to discover a battery backup (handy in case of electricity issues). Even though I've spent some 10 minutes on User Guide studying, I enjoyed smooth and quick installation - the feature I was looking to pick up initially.